JERUSALEM (Reuters) - Prime Minister Benjamin Netanyahu forged an election alliance with a far-right party on Wednesday that could give followers of the late anti-Arab rabbi, Meir Kahane, a stronger voice in Israeli politics. The deal, announced by Netanyahu's Likud and the ultranationalist Jewish Home party, was aimed at solidifying a potential right-wing coalition after the April 9 parliamentary election. Opinion polls predict Netanyahu's Likud will win the most parliamentary seats and will be in a position to form a governing coalition of rightist and religious parties similar to the one he now heads. But the surveys also show that a possible alliance between two of his strongest centrist opponents, former armed forces chief Benny Gantz, who leads the Resilience Party, and ex-finance minister Yair Lapid, head of the Yesh Atid faction, could spark an upset. Gantz and Lapid met on Wednesday, with speculation high they could strike a deal. Moving to counter that prospective partnership, Netanyahu agreed to set aside two cabinet posts for Jewish Home on condition it agreed to a merger with the Jewish Power party, whose leaders have portrayed themselves as Kahane's successors. Jewish Home's chairman said in a statement he accepted the deal after talks with Netanyahu. Its central committee then met and ratified the pact, party officials said. Jewish Power has already agreed to the merger, saying it would "prevent the establishment of a leftist government, God forbid". Such an alliance could be crucial to the two parties' survival: opinion polls have shown that Jewish Home and Jewish Power might not garner enough votes on their own to win even a single seat in the Knesset. Kahane, a U.S.-born rabbi, served one term in the Knesset in the 1980s as head of the Kach party, which advocated the "transfer" of Palestinians to neighbouring Arab countries and also called for a ban on intermarriage between Israeli Jews and Arabs. Kahane's movement was subsequently banned from Israeli politics as racist. He was assassinated in 1990 in New York by an Egyptian-born American. Netanyahu's political future has also been clouded by three corruption cases. The attorney-general is weighing whether to accept police recommendations to indict him over allegations he wrongfully accepted gifts from wealthy businessmen and dispensed favours to try to win favourable coverage in an Israeli newspaper and a website. 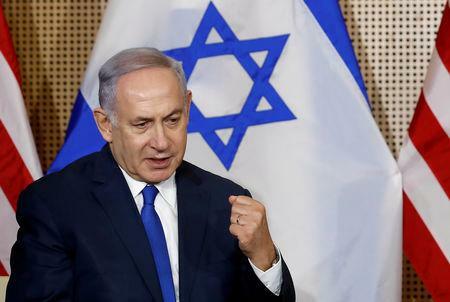 In office since 2009, after an earlier term as prime minister from 1996 to 1999, Netanyahu has denied wrongdoing. He says he is a victim of a left-wing witchhunt to topple him.